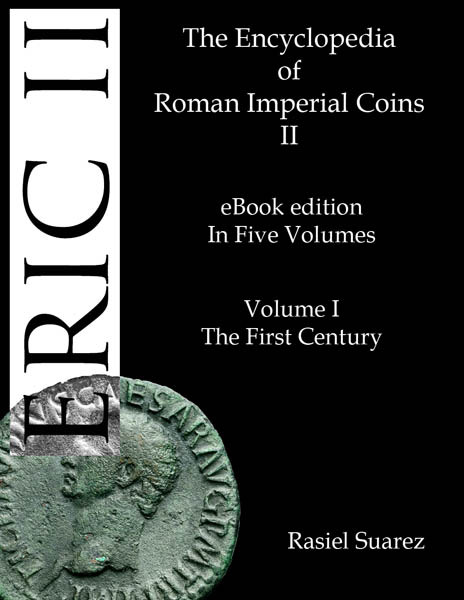 The first three of five planned volumes for the eBook version of ERIC II are now available as a download at a cost of only $5. The PDF may be used on any computer with Adobe Reader (chances are you already have it installed). It can also be loaded onto any e-reader such as a Kindle, Nook, iPhone/iPad, or your computer. Click here for the order page to purchase and download your copy. You can use your credit card or PayPal. Credit charges will appear under Dirty Old Coins, LLC. Volume I covers the "Twelve Caesars" period from Augustus through Domitian. Volume II covers the height of the Roman "pax Romana" from the time of Nerva through the reign of Clodius Albinus. Volume III is a complete catalog for the turbulent third century AD, a century which left a coinage legacy by dozens of rulers. Volume IV This section tackles head-on the enormous quantity of coins minted under Constantine's family, his rivals and the Valentinian and Theodosian dynasties that followed for a wholly comprehensive look at late Roman coinage. Volume V brings to a close the Roman epoch with the numismatic whimper that was the western Roman empire under Honorius through the brief reign of Romulus Augustus whose ouster in 476 signaled the end of the imperial line that had begun under Augustus five centuries before. -Unuseable if the power or batteries give out!